Twelve days ago I began an experiment in lifestyle design and financial independence. I moved into a travel trailer at a lake community just outside Raleigh. At the time when I moved in, there was no running water, no electricity, no phone service, and no internet access at the site. However, this is only the beginning of my experiment. Why would anyone choose to live this way? What would possess any sane person to move out of a 1,000 sqft home and live in a 200 sqft travel trailer? Even more, why make the move without running water, electricity, and the conveniences of modern communications? Let me begin by pointing out that I’m not making the claim that this is the right choice for everyone, or even for most people. However, it’s a great option for anyone interested in the tiny house movement that is beginning to take hold. As the organizer for the Triangle Tiny House meetup group, I fit right in with this group. Some time ago I came across the story of a young entrepreneur that had recently graduated college. He wanted something more than the 9 – 5 jobs and mortgages his peers were accepting as the status quo. Instead, he bought a small piece of land in the desert outside a small town in the southwestern United States. For several months, he camped in a tent there and rode his motorcycle into town to use the internet at the library. Each morning he would wake up with the sun and work at the library until they closed. At closing time, he would gather his laptop, MP3 player filled with podcasts, and a few booked he borrowed from the library. On his drive back to the camp site he would pick up some dinner and breakfast for the next day. This went on for months as he built his business, earned his first customers, and eventually grew a significant income. Today, this person has a business with enough revenue that he can afford a rather nice place to live and still put a significant chuck into savings. Unfortunately, I don’t recall the name of the site where I read about this or the name of the person. If you have seen this story before, please tell me where so I can cite it here. One of the goals I have been working toward is location independence. I experimented with this over the summer of 2014 when I traveled to Spain and Turkey for a month. At that time, I was working as a freelance writer and WordPress administrator. These jobs are done online and did not require me to be in any one place at any specific time. I was able to keep my income the same while only slightly increasing my expenses during that month. The biggest reason my expense increased was the rent I paid for an apartment back in Raleigh which I was not occupying while I was in Europe. Upon my return, I set about looking for a way to free myself from this rent payment while traveling. I have always been rather frugal and, until relatively recently, was unaware that a number of other people have similar interests. There has been a growing number of people pursuing Early Retirement Extreme thanks in part to there being a website and book that defines this concept. The basic idea is that you should put 70 – 80% of your income into investments for retirement, not the 10% that most financial advisers would suggest. Within this group, people tend to achieve financial independence within 5 – 10 years and it’s not uncommon for someone to be 25 – 30 years old when they become financially independent. I’ve discussed intentional living as a post on this blog and I even created a whole category for articles related to intentional living. Moving forward, this will be a major theme in my writing. Currently, I work as a digital nomad. This means I have a laptop that I take with me while traveling around the world. Anywhere I can find a decent connection to the internet can be my office for the day. 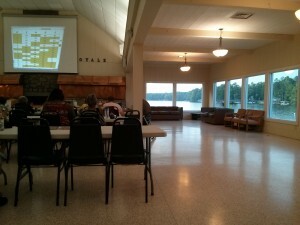 Right now, for example, I’m writing this post in the community center at Lake Royale while a group of people are playing bingo. Just outside the window, I’m watching the sun set over the lake and colors of the sky reflecting in the water. Moving to the lake has required some effort. While we’re going to have water, electric, and internet services installed – these things are not currently in place. By the end of the month, however, everything should be setup. 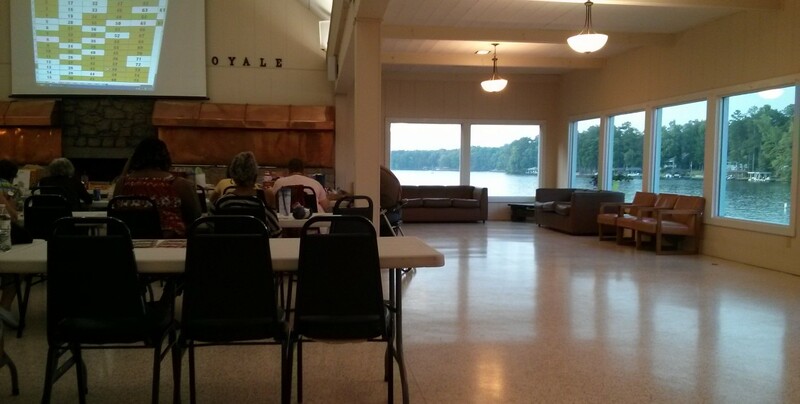 In the mean time, Lake Royale has camp bathrooms with running water and showers. Additionally, there are laundry facilities, a community pool, beaches on the lake, a put-put course, several picnic areas, parks, and outdoor grills. There is also a community center with a pool table, a community library, wireless internet access, and outlets to plugin a laptop. While we’re waiting for services to be connected at our lot, we can rely on these facilities. Even after we’re hooked up, I plan to spend some time each week working at the community center and the Bunn library just for a change of scenery (I don’t like working in the same place every day). I’ve had to downsize my personal belongings quite a bit, and I’m not someone that tends to have a lot of things. However, moving from 1,000 sqft down to 200 sqft will cause anyone to find a few items in the back of their closet which they could live without. If you’re thinking about moving into a tiny house, I highly recommend following the same advice given to travelers. While the move doesn’t impact the fact that last month was our last car payment, it’s still a major up-tick in our finances. Our base living expenses went from $895 each month down to $193. This does not include things like gas, food, and insurance. I’ll cover the changes in our finances in greater detail in a future post. For now, it’s sufficient to show that we’ve had a reduction in our monthly bills by about $700. That adds up fast, $8,400 by the end of just one year! We have decided to only spend our summers at the lake. This means we will be looking for a place to live from mid-October until mid-April. We’ll leave here just as the last of the leaves are falling from the treas and return shortly after the last of the overnight freezes has passed. This year, Barbie has been pushing for us to spend the winter in Malaga (a city in southern Spain). We have been looking at some apartments there and could rent a place with utilities and internet for around $500 per month. Additionally, the flights will only cost us around $100 each for round-trip transatlantic airfare (thanks to Cheap Flight Secrets). Next year, we’re not sure what we’ll do for the winter. We’ve been talking about an epic road-trip throughout the United States, spending some time in Playa del Carmen, or visiting Buenos Aires. This morning I work up at 8:30 am, well rested and ready for the day. The birds were chirping outside my window and the bedroom was filled with sunlight. I started my day with a pear for breakfast and some quiet time listening to the wilderness around us. Barbie and I loaded up the car and drove to the laundry facility at the north end of the lake. We dropped our clothes into a washing machine and took off with our cooler for some ice. The drive from the laundry facility, out of the lake, and into Bunn (where the ice machine is) allowed us to return with only a few minutes to wait before the laundry was done. We drove home and hung the clothes on the line to dry in the morning sun while we unpacked a few boxes and straightened up a little. We decided it was getting hot at around noon and we drove up to the pool. After two hours of swimming and soaking in the sun, we showered at the pool facilities and returned home for lunch. Just as a summer storm was rolling in over the lake, we decided to race for the community center and get some work done on the internet access there. I wrote a few article for clients, installed updates for the WordPress websites I manage, paid some bills, made a few phone calls, and now I’m writing this post. This evening, we will return home for dinner and be asleep in bed some time between 9 and 10 pm. This is a typical day for us with little variation. Rather than swimming at the pool, we may choose to go to the beach at the lake. Instead of doing laundry, I may go fishing or paddle my canoe around the lake. Some mornings we may get up at 6 am and others we’ll sleep in until 9 am. However, we generally go to bed around sunset, wake up around sunrise, eat natural foods, and get lots of exercise. This is a lifestyle that is improving our health, not harming us – and that’s not something we could say before we moved here. I loved reading your article. We, too, have downsized from our home in Raleigh to a camper (actually 2 campers). We have been weekenders for about 5 years and we’re all set up, except for internet. We got Century Link. Loving lake life. Do you have Century Link internet being installed, or just phone and TV without internet? We’re also having Century Link installed. We called the store in Wake Forest and got a great deal. $25/month for the first six months at which point we will be canceling the service while traveling to Spain. They even waived the installation fee and sent us a free modem. I highly recommend calling the store and asking for Adam! Thanks, I’m glad you enjoyed reading about my experiment in financial independence. Very interesting post. I see you both at the clubhouse working away on your laptops. Now I know what you do! I will introduce myself next time I see you. Happy you have chosen such a great place to live! We’ve introduced ourselves to a few people at the clubhouse. I figured sharing this post on the Lake Royale Facebook page was a better way to explain ourselves to the larger community. Next time you see us there, please say hello. We love meeting our neighbors. Such a beautiful look into your life and the camper concept! I really appreciate this. I live in LR also and have wondered of other ways to save for our family. I’m not sure how this would work for a family of three, with one being a six year old..but I look forward to reading more! I don’t have any personal experience living with children in an RV. However, there are a number of full-timers with kids sharing their experience online. Newschool Nomads is just one of them. We’re at 427 Osage Dr and we’ll drop by over the weekend if you’re around. Great article and glad to hear you’re both enjoying the lake life here at LR! Welcome! We’ve been here since ’07 and LOVE it. We moved from a 3k sq ft house in Wakefield to a little 1.4k sq ft home to enjoy life and not stress over everything. We also have been discussing living in a trailer to save money as well, but with a 13yo daughter not sure we can right now. In the next few years we will be living between here and Florida as other family members are living south. Keep posting as we’d love to keep seeing how you are doing. While I don’t personally have any experience living in a trailer with children, there are many others doing just that. Newschool Nomads is one blog that has a lot to share about their experience living in a trailer as a family with young children. Thanks for reading my post and I’m glad to hear there are others at the lake with similar interests. I am a financial expert and work with people to be able to live the life they want. Not your average adviser. (For example we lived off my income for the first year we were married and saved his. This allowed us to pay cash for our first house together.) I love the lake life too, and we enjoy our cabin at Lake Royale. My husband is retired in his early 50’s. I enjoy working and can work from anywhere too. I think we would get along just fine. I have TWC internet. No phone, just cell and internet phone for work. Love the tiny home movement. Also, I am great at helping people to travel on a budget. I love to see how cheap I can go great places. Hope to see you around. I would be happy to be a guest blog post anytime. Thank you for your comment. It seems like we have many overlapping interests and it would be great to connect in person. One of my projects at the lake is to start a tiny house group here which can connect with the Triangle Tiny House meetup I’ve already started. I’m looking into the process of forming a group through the POA and scheduling use of the community center. The first activities I have in mind are simply watching videos like Tiny, Small is Beautiful, and Tiny House Nation to introduce the topic and begin our discussion. That depends on your definition of “tiny home”. If you only include the type that are built to look like a typical house on a trailer, then Lake Royale does not allow those. However, I take a broader definition of “tiny home” to include campers, yurts, cottages, tree houses, small apartments, and any other structure where 100% of the living space is carefully planned for minimalist living. In the case of Lake Royale – you can live in a camper or cottage. You can even build a room addition and screened porch onto a camper at the lake. However, yurts and tree houses are not allowed under the current POA rules. My approach to tiny housing at the lake is to simply renovate a camper on a lot I purchased there. So, I guess the answer is maybe – it all depends on what type of “tiny house” interests you. P.S. You should join the Triangle Tiny House Meetup, if you haven’t already. I so enjoyed reading your blog. I too live at Lake Royale. I downsized as well living here even though I still have a storage building to empty out in TN. It is a hard transition, but well worth it. Sent you a friends request on FB. Can’t wait to watch you and your wife’s travel experiences and how you made that happen. I love tiny house nation. Maybe Lake Royale will change their mind as this movement grows. I welcome you guys to the lake and kudos to you. I am off and I will be there God willing. Thanks for letting me know. Is there anywhere to rent a place at at Lake Royal to park a class A? We travel almost full time but need a place when we come back home every 3 mo. While there are no rental lots that I am aware of at Lake Royale, there are inexpensive lots you could buy. A few thousand dollars will get you a lot where you could park your camper for storage. A few thousand more will get you a lot with electric and water hookups if you want to use the camper at Lake Royale while you’re there.